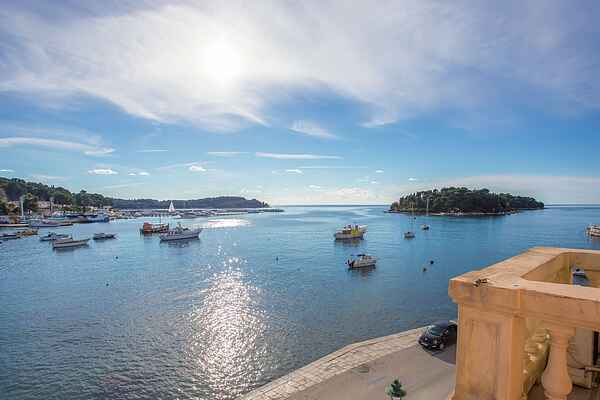 Beautiful apartment for 6 persons in the country house, situated on the main promenade of Rovinj. Apartment Viking is located on the 2nd floor and has a beautiful sea view, the harbor with boats and Rovinj. It consists of three bedrooms, a living room, kitchen, bathroom with shower and two small balconies. Two bedrooms have double beds, while the third bedroom is equipped with two single beds. Furthermore, there is a fully equipped kitchen, air conditioning, Wi-Fi, bed linen and towels. On the ground floor you can park your bicycles. Wake up with breathtaking sea views and enjoy your coffee with a view of a painted atmosphere. Come and visit us and experience an unforgettable holiday.